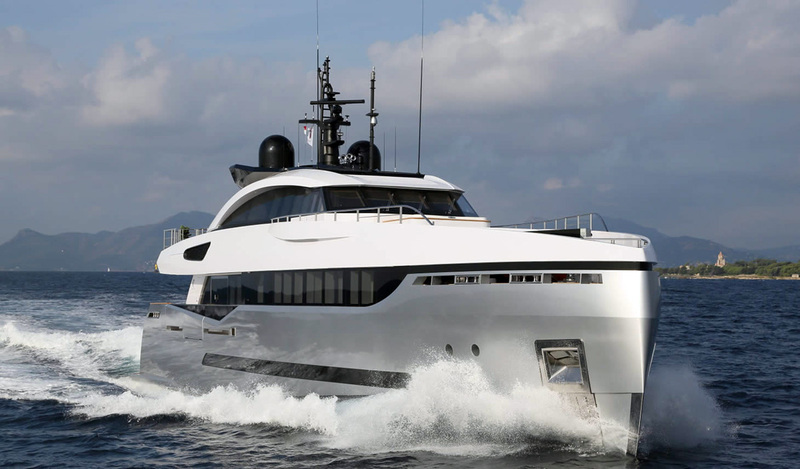 The 40m Sport Hybrid born as a strict cooperation between the Hydro Tec‘s Naval architects and Designers and the Broker Jimmy Brodesson. 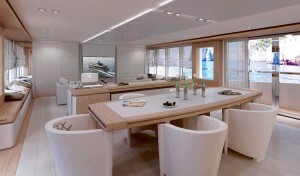 Jimmy had a Client that was looking for a cutting edge project that could stand above the yachts offered on the market. 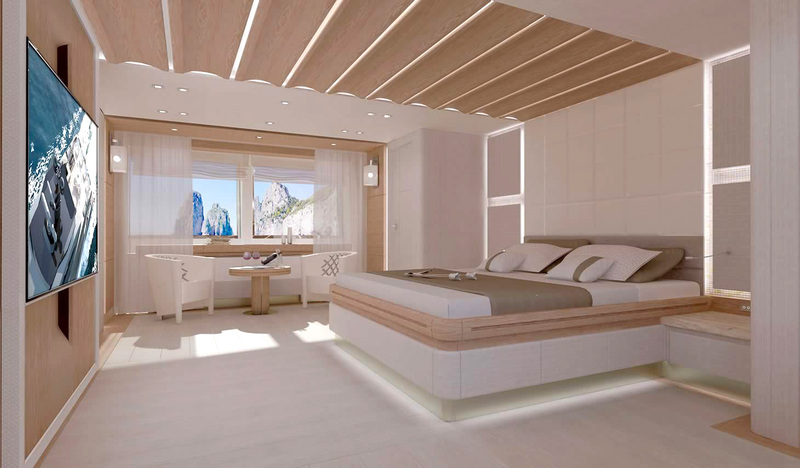 From the aesthetic point of view we designed a boat with a sporty, aggressive and contemporary exterior line that intelligently hides uncommon internal volumes and heights, while offering, spacious outdoor widely accessible and customizable areas. The interior spaces have been designed to be light and airy thanks to extraordinary interior heights and large windows, even in the spaces below deck. 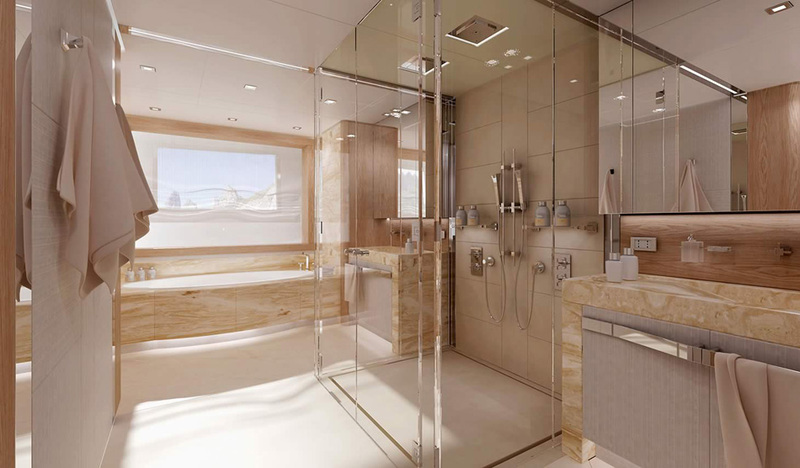 On the lower deck the layout accommodates four guest cabins and a comfortable crew area. 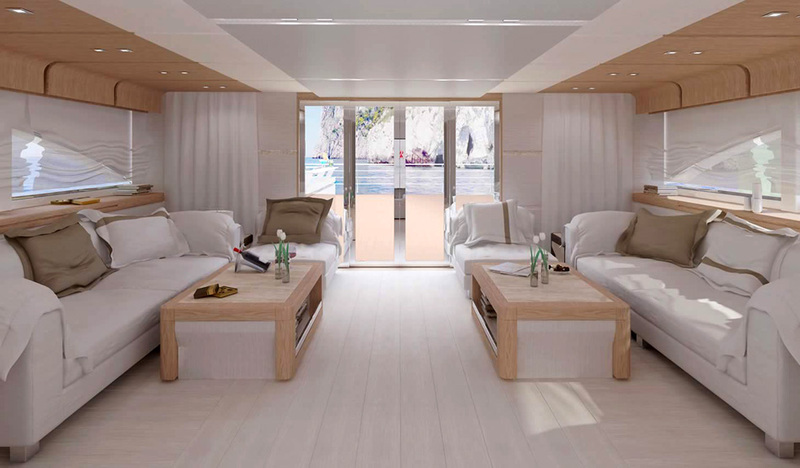 At the aft of the yacht, we fitted a tender garage and a beach club that, with opening the aft hatch, creates a wide swimming platform with a corner bar and dressing at sea level. 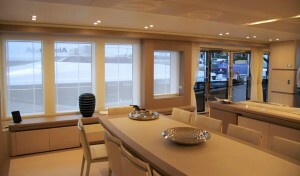 On the main deck, moving past an al-fresco dining area into, a well-lit salon with the area characterized by big windows and by the two side balconies placed on both sides converting this conversational layout into a truly unique main deck space. 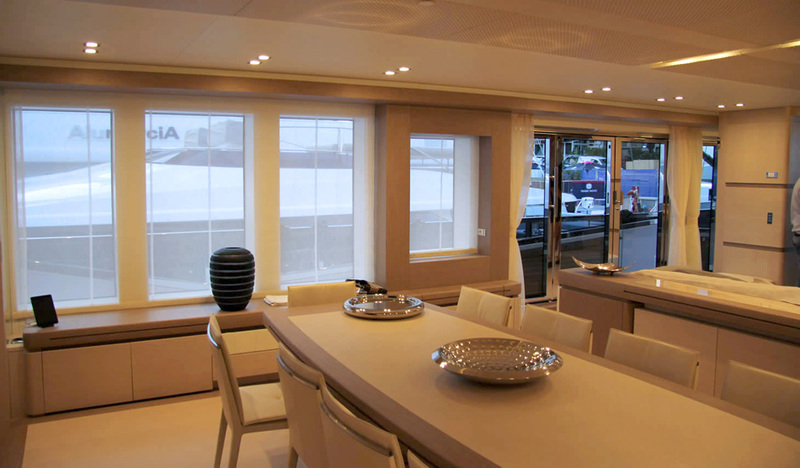 With the opening balconies and sliding doors open, puts the guests in close continuity with the outside environment. 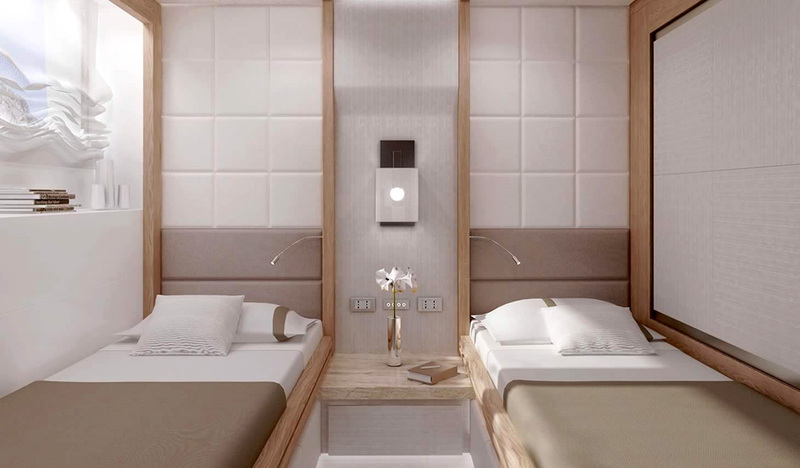 The forward area is, occupied by an extremely wide and accessible owner cabin. 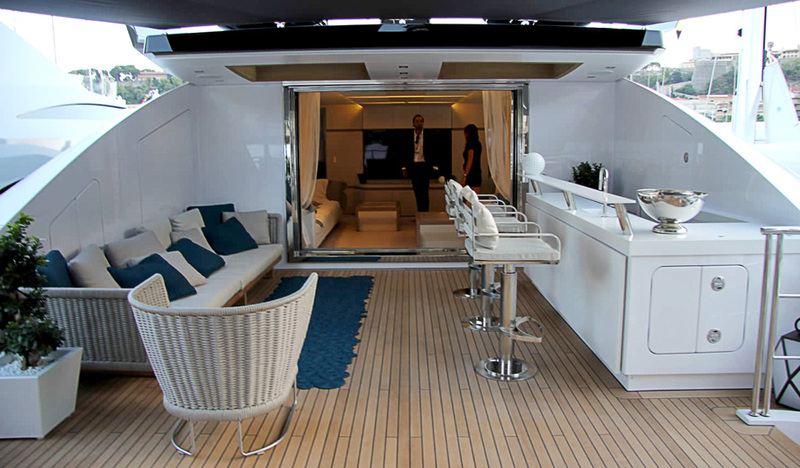 On the upper deck the aft lounge, easily converted into a media room leads to the outside area through a wide sliding door, becoming the perfect location for parties. 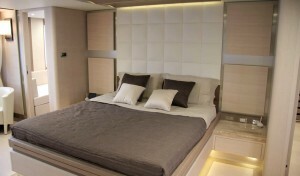 Moving forward on the upper deck finds a cozy and private area arranged with sun pads, seating and a Jacuzzi. 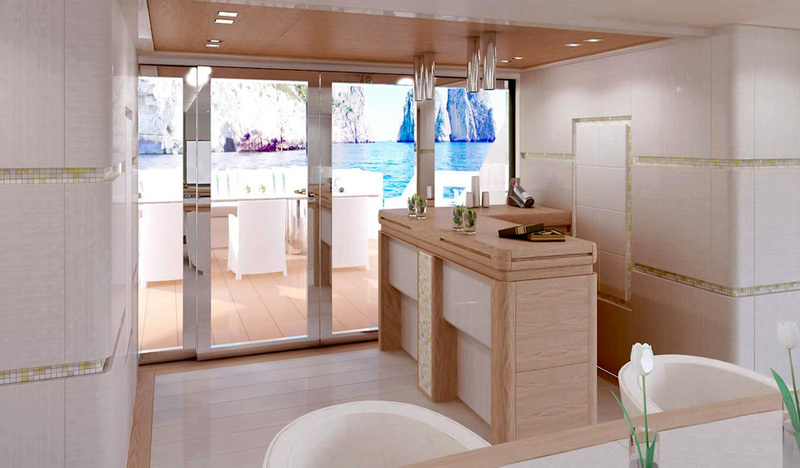 From the Technical point of view the 40SH is an aluminum semi-displacement yacht, whose design has been based on improving the efficiency and its eco-friendly impact. The innovative hybrid hull has been deeply studied and tested to improve its performances over a wide range of speeds, with additional efforts made on weight reductions through-out the vessel. 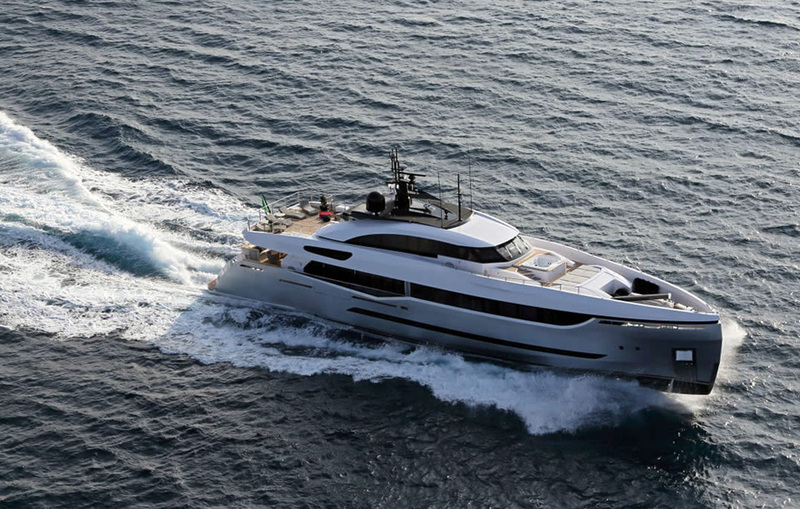 The aim was, to have a high performing yacht in terms of maximum speed but, also, highly performing in terms of consumption at low and intermediate speeds. 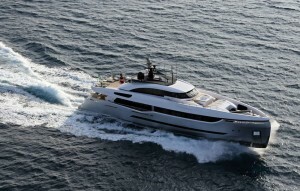 The results have been incredible, consuming 150l at 14 kn, the 40 SH is one of the most efficient yachts on the market. What really makes the 40SH unique is her hybrid propulsion system. 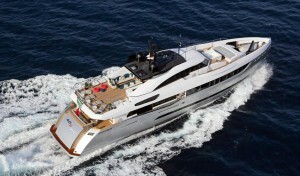 Hydro Tec approached the first certified hybrid propulsion vessel in the industry with a different point of view. We believed that batteries were not the answer on larger vessels because they are big and heavy, have a limited autonomy and lifespan, they also fail to cater all the hotel power demands. The 40 M Sport Hybrid, do not rely on battery banks but put its focus on the efficient and flexible power management of the power generation. The system combines twin 1,920-horsepower MTU main engines with two 75kW electric motors and three 80kW diesel generators in various operational modes. 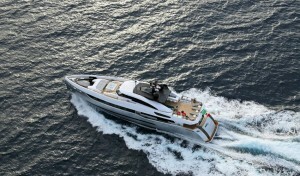 One mode is for cruising up to the yacht’s top speed of 22 knots, when the main engines provide the propulsive power. 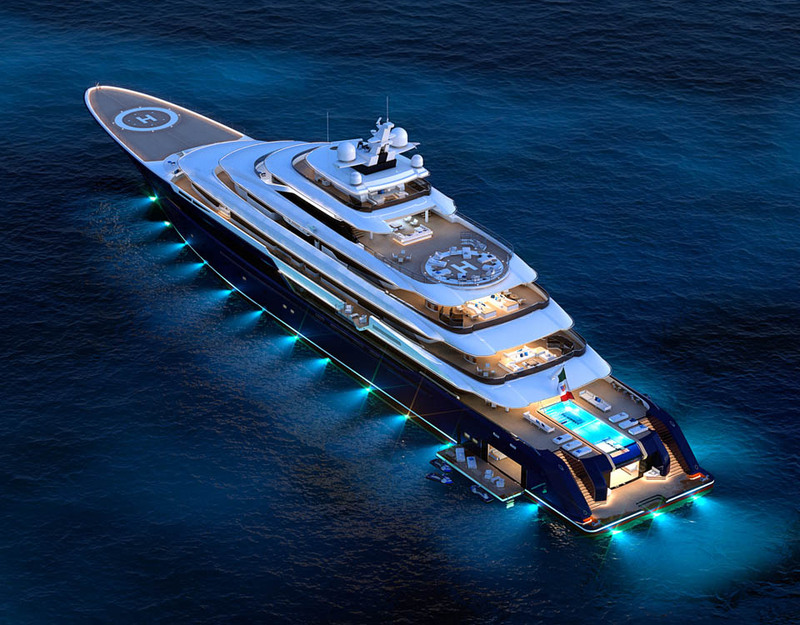 A second mode is when the yacht is approaching its cruising speed of 15 knots, when the two electric motors can work as shaft generators to provide the hotel power demands. 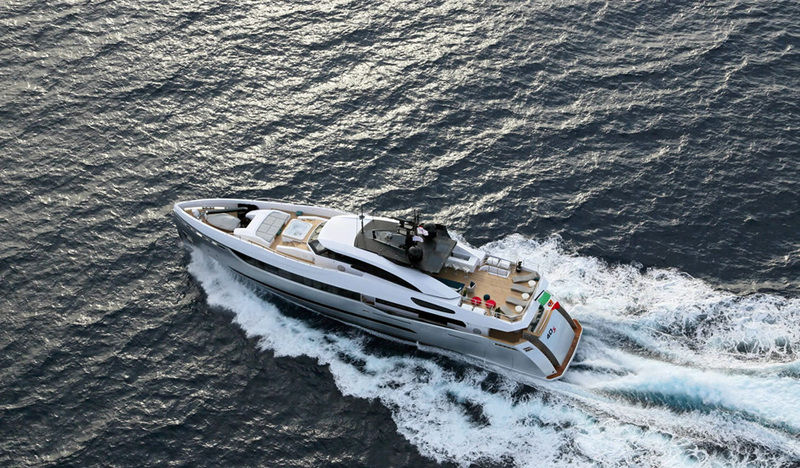 A third mode is for cruising at economical speed, when the diesel generators power the electric motors to drive the yacht at 7.5 knots in extremely quiet conditions with exceptionally low fuel consumption. 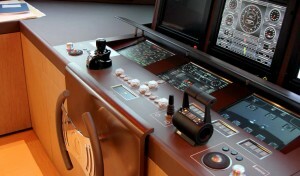 All the control systems of the hybrid propulsion have been overseen by RINA so, The Columbus 40 SH have been the first boat having the “Hybrid Propulsion” Class notation by RINA. Hull efficiency, eco-friendly impact, comfort, and interior space optimization have always been the base of design at Hydro Tec, with the 40 SH all the team, both Designers and Engineers wanted to push the boundaries. 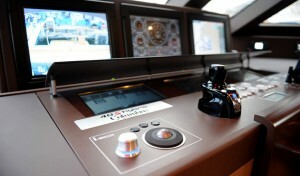 After the launch of the first unit we strongly believed as a team, that the final product was a job well done. 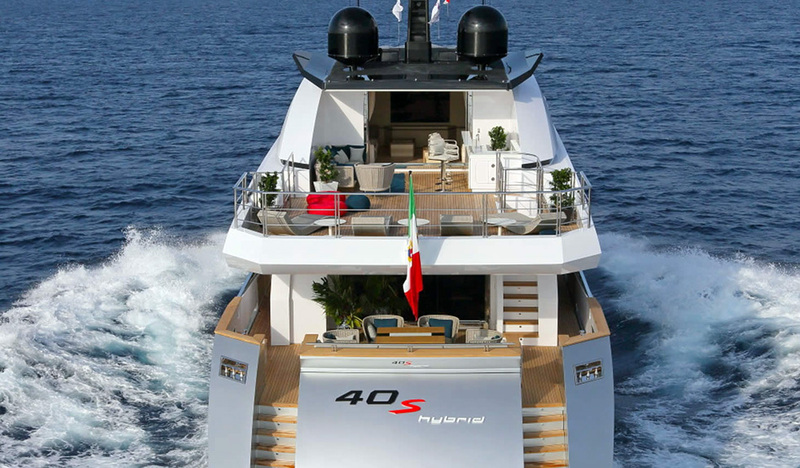 This was later proven by the overwhelming appreciation the 40SH received by winning multiple awards which included 3 of the coveted golden Neptunes at the Showboats Design Awards in 2014, where she was nominated in all possible categories. Further confirmation came with the 2013 environmental award by UIM and the Platinum rated Rina green plus certificate that proved we were on the correct path and always striving for the best.